This article is about virtualization software. For the desktop icon docker, see Dock (computing). For the company, see Docker, Inc. For other uses, see Docker (disambiguation). Docker is a computer program that performs operating-system-level virtualization. It was first released in 2013 and is developed by Docker, Inc.
Docker is used to run software packages called containers. Containers are isolated from each other and bundle their own application, tools, libraries and configuration files; they can communicate with each other through well-defined channels. All containers are run by a single operating-system kernel and are thus more lightweight than virtual machines. Containers are created from images that specify their precise contents. Images are often created by combining and modifying standard images downloaded from public repositories. The software debuted to the public in Santa Clara at PyCon in 2013. Docker was released as open source in March 2013. On March 13, 2014, with the release of version 0.9, Docker dropped LXC as the default execution environment and replaced it with its own libcontainer library written in the Go programming language. On September 19, 2013, Red Hat and Docker announced a collaboration around Fedora, Red Hat Enterprise Linux, and OpenShift. In November 2014 Docker container services were announced for the Amazon Elastic Compute Cloud (EC2). On November 10, 2014, Docker announced a partnership with Stratoscale. On December 4, 2014, IBM announced a strategic partnership with Docker that enables Docker to integrate more closely with the IBM Cloud. On June 22, 2015, Docker and several other companies announced that they are working on a new vendor and operating-system-independent standard for software containers. As of October 24, 2015[update], the project had over 25,600 GitHub stars (making it the 20th most-starred GitHub project), over 6,800 forks, and nearly 1,100 contributors. In April 2016, Windocks, an independent ISV released a port of Docker's open source project to Windows, supporting Windows Server 2012 R2 and Server 2016, with all editions of SQL Server 2008 onward. A May 2016 analysis showed the following organizations as main contributors to Docker: The Docker team, Cisco, Google, Huawei, IBM, Microsoft, and Red Hat. On October 4, 2016, Solomon Hykes announced InfraKit as a new self-healing container infrastructure effort for Docker container environments. A January 2017 analysis of LinkedIn profile mentions showed Docker presence grew by 160% in 2016. Docker can use different interfaces to access virtualization features of the Linux kernel. 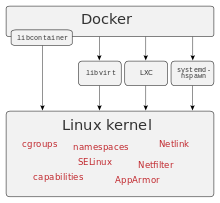 Docker is developed primarily for Linux, where it uses the resource isolation features of the Linux kernel such as cgroups and kernel namespaces, and a union-capable file system such as OverlayFS and others to allow independent containers to run within a single Linux instance, avoiding the overhead of starting and maintaining virtual machines (VMs). The Linux kernel's support for namespaces mostly isolates an application's view of the operating environment, including process trees, network, user IDs and mounted file systems, while the kernel's cgroups provide resource limiting for memory and CPU. Since version 0.9, Docker includes the libcontainer library as its own way to directly use virtualization facilities provided by the Linux kernel, in addition to using abstracted virtualization interfaces via libvirt, LXC and systemd-nspawn. Building on top of facilities provided by the Linux kernel (primarily cgroups and namespaces), a Docker container, unlike a virtual machine, does not require or include a separate operating system. Instead, it relies on the kernel's functionality and uses resource isolation for CPU and memory, and separate namespaces to isolate the application's view of the operating system. Docker accesses the Linux kernel's virtualization features either directly using the libcontainer library, which is available as of Docker 0.9, or indirectly via libvirt, LXC (Linux Containers) or systemd-nspawn. Software: The Docker daemon, called dockerd, is a persistent process that manages Docker containers and handles container objects. The daemon listens for requests sent via the Docker Engine API. The Docker client program, called docker, provides a command-line interface that allows users to interact with Docker daemons. Objects: Docker objects are various entities used to assemble an application in Docker. The main classes of Docker objects are images, containers, and services. A Docker container is a standardized, encapsulated environment that runs applications. A container is managed using the Docker API or CLI. A Docker image is a read-only template used to build containers. Images are used to store and ship applications. A Docker service allows containers to be scaled across multiple Docker daemons. The result is known as a swarm, a set of cooperating daemons that communicate through the Docker API. Registries: A Docker registry is a repository for Docker images. Docker clients connect to registries to download ("pull") images for use or upload ("push") images that they have built. Registries can be public or private. Two main public registries are Docker Hub and Docker Cloud. Docker Hub is the default registry where Docker looks for images. Docker registries also allow the creation of notifications based on events. Docker Compose is a tool for defining and running multi-container Docker applications. It uses YAML files to configure the application's services and performs the creation and start-up process of all the containers with a single command. The docker-compose CLI utility allows users to run commands on multiple containers at once, for example, building images, scaling containers, running containers that were stopped, and more. Commands related to image manipulation, or user-interactive options, are not relevant in Docker Compose because they address one container. The docker-compose.yml file is used to define an application's services and includes various configuration options. For example, the build option defines configuration options such as the Dockerfile path, the command option allows one to override default Docker commands, and more. The first public version of Docker Compose (version 0.0.1) was released on December 21, 2013. The first production-ready version (1.0) was made available on October 16, 2014. Docker Swarm provides native clustering functionality for Docker containers, which turns a group of Docker engines into a single virtual Docker engine. In Docker 1.12 and higher, Swarm mode is integrated with Docker Engine. The swarm CLI utility allows users to run Swarm containers, create discovery tokens, list nodes in the cluster, and more. The docker node CLI utility allows users to run various commands to manage nodes in a swarm, for example, listing the nodes in a swarm, updating nodes, and removing nodes from the swarm. Docker manages swarms using the Raft Consensus Algorithm. According to Raft, for an update to be performed, the majority of Swarm nodes need to agree on the update. Docker implements a high-level API to provide lightweight containers that run processes in isolation. Docker is a tool that can package an application and its dependencies in a virtual container that can run on any Linux server. This helps enable flexibility and portability on where the application can run, whether on premises, public cloud, private cloud, bare metal, etc. Because Docker containers are lightweight, a single server or virtual machine can run several containers simultaneously. A 2016 analysis found that a typical Docker use case involves running five containers per host, but that many organizations run 10 or more. Using containers may simplify the creation of highly distributed systems by allowing multiple applications, worker tasks and other processes to run autonomously on a single physical machine or across multiple virtual machines. This allows the deployment of nodes to be performed as the resources become available or when more nodes are needed, allowing a platform as a service (PaaS)-style of deployment and scaling for systems such as Apache Cassandra, MongoDB and Riak. Docker can be integrated into various infrastructure tools, including Amazon Web Services, Ansible, CFEngine, Chef, Google Cloud Platform, IBM Bluemix, HPE Helion Stackato, Jelastic, Jenkins, Kubernetes, Microsoft Azure, OpenStack Nova, OpenSVC, Oracle Container Cloud Service, Puppet, ProGet, Salt, Vagrant, and VMware vSphere Integrated Containers. The Cloud Foundry Diego project integrates Docker into the Cloud Foundry PaaS. Nanobox uses Docker (natively and with VirtualBox) containers as a core part of its software development platform. Red Hat's OpenShift PaaS integrates Docker with related projects (Kubernetes, Geard, Project Atomic and others) since v3 (June 2015). The Apprenda PaaS integrates Docker containers in version 6.0 of its product. Jelastic PaaS provides managed multi-tenant Docker containers with full compatibility to the native ecosystem. The Tsuru PaaS integrates Docker containers in its product in 2013, the first PaaS to use Docker in a production environment. On October 15, 2014, Microsoft announced integration of the Docker engine into the next Windows Server release, and native support for the Docker client role in Windows. On June 8, 2016, Microsoft announced that Docker now could be used natively on Windows 10 with Hyper-V Containers, to build, ship and run containers utilizing the Windows Server 2016 Technical Preview 5 Nano Server container OS image. Since then, a feature known as Windows Containers was made available for Windows 10 and Windows Server 2016. There are two types of Windows Containers: "Windows Server Containers" and "Hyper-V Isolation". The former has nothing to do with Docker. The latter, however, is a form of hardware virtualization (as opposed to OS-level virtualization) and uses Docker to deliver the guest OS image. The guest OS image is a Windows Nano Server image, which is 652 MB in size and has the same limitations of Nano Server, as well as a separate end-user license agreement. ^ Docker on macOS uses a Linux virtual machine to run the containers. It is also possible to run those on Windows using Hyper-V or docker-machine. ^ "Docker Releases". GitHub. Docker, Inc. February 28, 2019. Retrieved March 24, 2019. ^ "Docker source code". docs.docker.com. Docker, Inc. October 12, 2015. Retrieved October 24, 2015. ^ "Get started with Docker for Windows". docker.com. Retrieved September 27, 2018. ^ "Get started with Docker for Mac". docker.com. Retrieved September 27, 2018. ^ Michael Friis (March 2, 2017). "Announcing Docker Enterprise Edition". Retrieved March 2, 2017. ^ O'Gara, Maureen (July 26, 2013). "Ben Golub, Who Sold Gluster to Red Hat, Now Running dotCloud". SYS-CON Media. Retrieved August 9, 2013. ^ Vivek Ratan (February 8, 2017). "Docker: A Favourite in the DevOps World". Open Source For U. Retrieved June 14, 2017. ^ "Docker frequently asked questions (FAQ)". 2019-03-02. ^ "One home for all your apps". dotcloud.com. Archived from the original on May 17, 2014. Retrieved May 8, 2014. ^ "Docker announcement". Retrieved July 13, 2018. ^ a b Avram, Abel (March 27, 2013). "Docker: Automated and Consistent Software Deployments". InfoQ. Retrieved August 9, 2013. ^ a b Steven J. Vaughan-Nichols (June 11, 2014). "Docker libcontainer unifies Linux container powers". ZDNet. Retrieved July 30, 2014. ^ a b Swan, Chris (March 13, 2014). "Docker drops LXC as default execution environment". InfoQ. Retrieved January 20, 2015. ^ "DotCloud Pivots And Wins Big With Docker, The Cloud Service Now Part Of Red Hat OpenShift". TechCrunch. September 19, 2013. Retrieved January 20, 2014. ^ Jeff Barr (November 13, 2014). "Amazon EC2 Container Service (ECS) – Container Management for the AWS Cloud". Amazon Web Services Blog. Retrieved April 29, 2017. ^ John Rath (November 10, 2014). "Stratoscale Raises $32M to Build Docker-Supporting OpenStack Clouds on Commodity Servers". Retrieved January 3, 2016. ^ "IBM and Docker Announce Strategic Partnership to Deliver Enterprise Applications in the Cloud and On Prem". IBM. December 4, 2014. Retrieved April 20, 2015. ^ Frederic Lardinois (June 22, 2015). "Docker, CoreOS, Google, Microsoft, Amazon And Others Come Together To Develop Common Container Standard". TechCrunch. Retrieved August 8, 2015. ^ Shirley Siluk (June 22, 2015). "Docker, Tech Giants Team on Open Container Project". cio-today.com. Retrieved August 8, 2015. ^ "dotcloud/docker". github.com. Retrieved April 13, 2015. ^ Serdar Yegulalp (April 4, 2016). "Windocks does what Docker and Microsoft can't do". Retrieved October 27, 2018. ^ "Docker – Updated project statistics". Gist. Retrieved August 22, 2016. ^ Clarke, Gavin (October 5, 2016). "Docker emits InfraKit to wrangle containers on competing clouds". Retrieved October 7, 2016. ^ "Docker Debuts Infrakit Open Source Toolkit for Self-Healing Infrastructure". www.serverwatch.com. Retrieved October 7, 2016. ^ Michael Mullany. "Docker Momentum Analysis 2016". Retrieved January 5, 2017. ^ a b c "Docker 0.9: Introducing execution drivers and libcontainer". docker.com. March 10, 2014. Retrieved January 20, 2015. ^ "Select a storage driver documentation". Docker documentation. Archived from the original on December 6, 2016. Retrieved December 7, 2016. ^ "Docker Documentation: Kernel Requirements". docker.readthedocs.org. January 4, 2014. Archived from the original on August 21, 2014. Retrieved August 20, 2014. ^ Dan Walsh (2014-09-15). "Yet Another Reason Containers Don't Contain: Kernel Keyrings". projectatomic.io. Retrieved April 13, 2015. ^ a b "Limit a container's resources". Docker Documentation. Retrieved March 7, 2018. ^ "libcontainer – reference implementation for containers". github.com. Retrieved July 30, 2014. ^ a b Noyes, Katherine (August 1, 2013). "Docker: A 'Shipping Container' for Linux Code". Linux.com. Retrieved August 9, 2013. ^ a b c d e f g "Docker overview". Docker Documentation. Retrieved February 26, 2018. ^ "dockerd". Docker Documentation. Retrieved February 26, 2018. ^ "Use the Docker command line". Docker Documentation. Retrieved February 26, 2018. ^ "The Docker Ecosystem: An Introduction to Common Components". www.digitalocean.com. Retrieved February 26, 2018. ^ "About Registry". Docker Documentation. Retrieved February 26, 2018. ^ "Work with notifications". 2019-03-02. ^ "Overview of Docker Compose". Retrieved July 6, 2017. ^ "Compose command-line reference". Docker Documentation. Retrieved February 28, 2018. ^ "Orchestrate Containers for Development with Docker Compose". via @codeship. May 27, 2015. Retrieved February 28, 2018. ^ "Compose file version 3 reference". Docker Documentation. Retrieved February 28, 2018. ^ Firshman, Ben (December 21, 2013). "Release 0.0.1". docker/compose. Docker, Inc. – via GitHub. ^ Prasad, Aanand (October 16, 2014). "Release 1.0.0". docker/compose. Docker, Inc. – via GitHub. ^ "8 Container Orchestration Tools to Know". April 12, 2017. Retrieved July 6, 2017. ^ "Docker Swarm". Retrieved July 6, 2017. ^ "Swarm command-line reference". Docker Documentation. Retrieved February 28, 2018. ^ "docker node". Docker Documentation. Retrieved February 28, 2018. ^ "Docker Swarm 101". aquasec.com. Retrieved February 28, 2018. ^ "Raft Consensus Algorithm". raft.github.io. Retrieved February 28, 2018. ^ "8 surprising facts about real Docker adoption". Datadog. June 2016. Retrieved November 14, 2016. ^ Hall, Adron (July 31, 2013). "OSCON : Conversations, Deployments, Architecture, Docker and the Future?". CloudAve. Retrieved August 9, 2013. ^ Reeder, Travis (April 22, 2014). "How Docker Helped Us Achieve the (Near) Impossible". Iron.io. Retrieved July 25, 2014. ^ "Amazon EC2 – Docker Documentation". docs.docker.com. Archived from the original on October 18, 2014. Retrieved October 18, 2014. ^ "ansible/library/cloud/docker". GitHub. Archived from the original on December 27, 2013. Retrieved January 20, 2014. ^ "CFEngine". CFEngine. Archived from the original on June 13, 2014. Retrieved June 6, 2014. ^ "thoward/docker-cookbook". GitHub. Retrieved January 20, 2014. ^ "Containers on Google Cloud Platform". Google Inc.
^ "Bluemix Launches IBM Containers Beta Based on Docker". IBM. December 4, 2014. Retrieved April 20, 2015. ^ "Jelastic Announces Docker Integration to Provide the Most Advanced Orchestrated Application Delivery". PRWeb. Retrieved December 3, 2014. ^ "georgebashi/jenkins-docker-plugin". GitHub. Retrieved January 9, 2017. ^ Surana, Ramit (September 16, 2015). "Containerizing Docker on Kubernetes". LinkedIn. Retrieved November 2, 2015. ^ "The Docker Virtual Machine Extension for Linux on Azure". Microsoft. June 29, 2015. Retrieved August 11, 2015. ^ Stefano Maffulli (June 7, 2013). "OpenStack Community Weekly Newsletter (May 31 – June 7)". The OpenStack Blog. Retrieved January 20, 2014. ^ "OpenSVC Docker". OpenSVC. Retrieved May 29, 2014. ^ Native, Cloud. "Oracle Container Cloud Service Explained By Oracle.com". ^ Gareth Rushgrove. "garethr/docker". Puppet Forge. Retrieved January 20, 2014. ^ "private Docker Registry". Retrieved March 20, 2018. ^ "saltstack/dockerio". Retrieved January 20, 2014. ^ "philspitler/vagrant-docker". GitHub. Archived from the original on August 9, 2013. Retrieved January 20, 2014. ^ "What is VMware vSphere Integrated Containers (VIC)? - Definition from WhatIs.com". ^ Fulton III, Scott M. (September 4, 2015). "VMware's Photon Platform and How it Treats Containers". The New Stack. Retrieved June 8, 2017. ^ Whelan, Phil (September 3, 2014). "Cloud Foundry: Diego Explained By Onsi Fakhouri". ActiveState. Retrieved April 20, 2015. Functionality is being added to enable end-users to push Docker images directly into a Cloud Foundry cluster running Diego. ^ Jackson, Joab (April 16, 2014). "Red Hat to update Docker container tech for enterprises: Open source vendor plans to incorporate advanced Linux tools such as systemd and SELinux into Docker". Computerworld. Computerworld, Inc. Retrieved May 29, 2014. Red Hat has also started a second community project, called GearD, to integrate Docker into its PaaS (platform-as-a-service) hosting software, OpenShift Origin. ^ Verge, Jason (April 28, 2015). "PaaS and Docker Containers Work Together in Latest Apprenda Release". Data Center Knowledge. Retrieved December 6, 2015. The 6.0 release integrates Docker's flexibility and portability with the compliance, governance and security capabilities that enterprises need from PaaS. ^ Medina, Andrews (November 15, 2013). "Docker and Tsuru". Docker. Retrieved December 6, 2015. ^ Mary Jo Foley (October 15, 2014). "Docker container support coming to Microsoft's next Windows Server release". ZDNet. Retrieved October 16, 2014. ^ Scott Guthrie (October 15, 2014). "Docker and Microsoft: Integrating Docker with Windows Server and Microsoft Azure". Microsoft. Retrieved January 12, 2015. ^ "Announcing Windows 10 Insider Preview Build 14361". Microsoft. June 8, 2016. Retrieved June 19, 2016. ^ Brown, Taylor (May 2, 2016). "Windows Containers". Microsoft Docs. Microsoft. ^ Brown, Taylor (September 29, 2016). "Windows Container on Windows 10". Microsoft Docs. Microsoft. ^ Cooley, Sarah; Brown, Taylor (January 5, 2018). "Container OS Image EULA". Microsoft Docs. Microsoft.